Our Semi Traditional Kilt is made with pride in the UK using high quality 12 oz Polyester Viscose material instead of wool which allows the kilt to be washed. Perfect for the first time kilt wearer who is working to a budget. The kilt is coated with a specially crafted Teflon coating for added protection & makes use of Low Pill technology which prevents against pilling. The construction of the kilt is of such great quality that it has no problem holding its pleats, and it is very easy to iron. The Semi Traditional Kilt is great for formal occasions. The Semi Traditional Kilt is also ideal for the customer who already has a 100% wool kilt, as this kilt is more hard wearing than a 100% wool kilt. 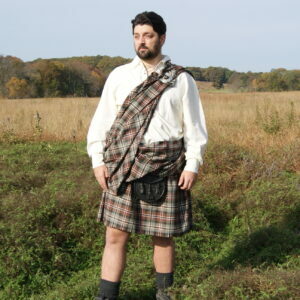 It is perfect for those who need a lighter kilt or for someone who will wear it in hot climates. Therefore, it is versatile kilt suitable for a whole host of different occasions. Some people who have bought this kilt say that they’ve worn it to a wedding then worn it casually with a t-shirt. The choice is yours! – Made of PV material expertly woven in the UK – 5 to 7 Yards 12 oz. 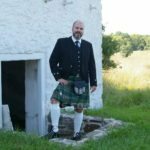 – The kilt is available in many different tartans. You can select from a database of 100 tartans. 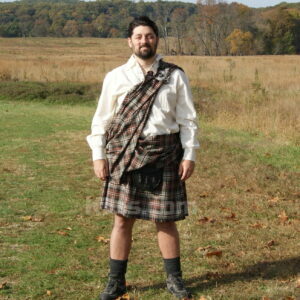 – The kilt is coated with Teflon to reduce the likelihood of any stains from harming your kilt. – Easy to clean, as the Semi Traditional Kilt is machine washable. This is not possible with a 100% woolen kilt. – Easy to iron & the pleats are held with style, even after prolonged wearing. – Each kilt is custom made for you and you alone. We add the personal touch. 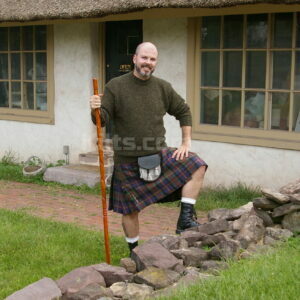 – The Semi Traditional kilt is Top Stitched. – You can expect 1″ pleats. – The kilt is tapered down the fell to ensure it matches your shape. – “Swing” is possible, but maybe not as much as our 100% woolen kilts. – The kilt features three premium leather straps & the kilt is also fitted with durable high quality cast buckles. 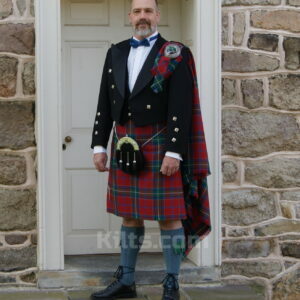 – The kilt is fitted with two belt loops for holding your kilt belt.